Just like in humans, diabetes in dogs is a condition that involves your pet losing homeostatic balance of its blood sugar. You might think this sounds relatively non-threatening however blood sugar (also referred to as blood glucose) supplies the brain, and many other organs in the body, the energy they need for correct metabolic functioning. Your vet can tell you more about the management and prevention of the condition and if you suspect that your pet is at risk from the disease then speak to your veterinarian for more information. Canine Diabetes – What is it? 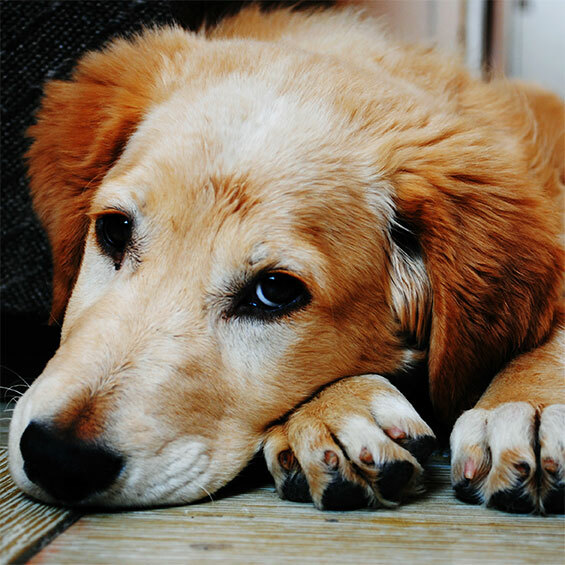 • Type II Diabetes Mellitus often occurs in older and overweight dogs. If you are fortunate it can be managed through weight loss and diet management, with the potential for initial insulin therapy whilst blood glucose levels stabilise. • Diabetes Insipidus or “water diabetes” is related to a deficiency in a hormone known as vasopressin which regulates water retention and intake, and can result in extreme thirst and frequent urination. • Juvenile onset diabetes occurs in some puppies and often results in a failure to grow and thrive, together with difficulty in putting on weight, leaving the puppy weak and even with partial paralysis. Diabetes Mellitus is caused by a lack of the hormone insulin within the body; this may result from the body not producing enough or not responding efficiently to the insulin that is produced. Insulin is produced by the pancreas in most mammals and acts to lower blood glucose levels, increasing that being stored by cells if it is not required for instant energy. When we have a meal, the body senses the products of digestion (in this instance glucose) entering the bloodstream and the brain decides on what would be the most appropriate amount of insulin to release to return blood sugar back to “normal”. Extremely low blood glucose levels are dangerous because the blood needs a steady and continuous supply of glucose to function correctly. The body stores glucose as glycogen within its cells and if it senses blood glucose levels are getting low it can turn this glycogen back into glucose, increasing blood sugar levels and returning them to normal. The other alternative is telling the animal to seek food and eat! However, this is not always a possible or efficient process. Occasionally you or your pet may experience low blood sugar, or hypoglycaemia, as the sensation of feeling hungry, craving sugar and even feeling shaky, light headed and panicky if you are not able to quickly have something to eat. This is your body way of telling you to find something to eat URGENTLY to increase your blood sugar levels and return them to “normal”. On the other end of the scale, extremely high blood glucose levels, a.k.a hyperglycaemia, are equally detrimental to health and function, having a toxic effect on organs and blood vessels. Left unregulated for too long hyperglycaemia can cause diabetic coma, severe dehydration (as the body puts water back into the bloodstream to try and dilute the high amounts of blood glucose), tiredness or blurred vision, and long-term effects such as cataracts and loss of muscle mass. Luckily for most of us and our pets, this constant battle of glucose regulation carries on inside of us without us needing to give it much thought. However, for those owners and pets with diabetes balancing this glucose regulation must be done consciously instead via appropriate dietary choices and insulin therapy where needed. This description of glucose regulation, however, is the process stripped down to its most basic form. It is not a simple process and please don’t believe that giving your pets more “sugar” is the key to avoiding problems – if anything it is quite the opposite. A change in appetite – Your dog may seem ravenous at times or perhaps just much more hungry than normal. This relates to the rollercoaster ride your dog’s blood sugar levels will be going on with the brain dictating its requirement for more sugar. You might find your dog behaving in unusual ways such as scavenging, stealing food off the table and begging much more frequently. I once had a friend with a male Cairn Terrier who was in the initial stages of balancing his insulin therapy. One day he was so hungry that it broke into the pantry and ate a bag of raw potatoes! This was very unusual behaviour for her small, once fussy dog but thankfully it was fine and did not have any similar episodes once his insulin treatment was reviewed by the vet. Excessive thirst/increase in water consumption – An insatiable thirst alongside appetite is another key indicator that something is wrong. If your dog is spending longer at its water bowl and visiting it more often, monitoring its water intake may indicate evidence of this. Increased urination – What goes in must come out. If your dog is drinking more water it will be urinating more frequently. If your older dog starts to urinate in the house it may not be due to incontinence but due to his or her body’s attempt at flushing out excess sugar to balance blood glucose levels. Weight Loss – If your dog has been overweight and all your hard work at keeping him on a strict diet seems to be paying off with a sudden drop in his weight, it may be due to diabetes. Even with an increase in appetite for food, an unbalanced glucose metabolism in the body can lead to a drop in weight. Lethargy – You may notice slumps in their energy as blood sugar levels exhaustingly spike and dip. This may mean their behaviour changes, and they may be less likely to play or pester for walks. Dehydration – Partly linked to an increased thirst. Dogs can start looking a bit unkempt and “scruffier” as their body condition drops alongside their weight, and their coat seems to “stand” as a result of dehydration and the failure to thrive. Vomiting – The body’s quick solution to purging unwanted glucose. High blood glucose levels can cause nausea and a general feeling of “unwell”. Cataract formation & blindness – High blood sugar can be harmful to the tiny blood capillaries that support the eye, as well as circulation at the extremities. Once again, my friends Cairn Terrier that developed diabetes suffered clouding of the eyes, which quickly developed into complete blindness in what seemed like the space of a few weeks. If a dog suddenly loses its sight like this it can be quite upsetting for the owner to see their dog suddenly bumping into things. You can help dogs adjust at this time by keeping things in the same places. There are also special dog-friendly scents you can buy to spray on door frames or new furniture, increasing the likelihood of the dog noticing it is there, but also letting it create a “map” of the room using these smells as landmarks. Remember though that some smells are unpleasant for dogs so speak to your vet about what products are available and appropriate for dogs. Chronic skin infections and/or shedding – With dehydration, poor circulation to the capillaries that service the skin and the strain on your dog’s immune system skin infections can become more likely. Regularly check your dog’s skin and coat all over whilst grooming them and look out for signs of flaky skin, dullness or dander. Likewise, fur loss and shedding may also become apparent. Bad or sweet-smelling breath or sweet-smelling urine – With an unregulated glucose metabolism the body will start to break down fat reserves (see weight-loss) to compensate for poor glucose regulation. The process involved is known as ketosis. Dogs in ketosis often produce a sweet smell or one that owners would describe as rotting fruit (in humans people say it smells like pear drops) in their breath or urine. Urinary infections – Another side effect of the body struggling to regulate its glucose balance. If you notice one or more of the symptoms listed above in your pet then speak to your veterinarian and they can carry out some simple tests to see whether diabetes is the cause. Your vet is likely to want to carry out a health check, take blood samples and perform a urinary analysis in order to monitor glucose levels. It is important to follow your vet’s guidance around feeding under such circumstances in order to allow the best chance of accurate results. For Type I diabetes mellitus the most common result will be treated with insulin therapy. This involves a daily (often multiple) injections of insulin for your dog as per the vet’s instructions. This can be quite daunting at first, especially if you have never given an injection before, however, the vet will show where and how to inject your dog. It is likely you’ll need to keep a diary for the first week or so to assess whether the prescribed regime is suitable for your dog. This is likely to involve what your dog eats, how much insulin you inject and any behavioural changes (e.g. improved energy levels or an insatiable appetite earlier in the day than feed times) before reporting back to your vet. Keeping mealtimes regular (at the same times each day, feeding the same food in the same amounts) and importantly not giving your pet treats between meals can help stabilise their blood sugar. This, in turn, should lead to them starting to feel better and recovering their weight and condition if they have suffered. Your vet will probably also advise more regular check-ups to monitor the general health and condition of your pet and progress with treatment. Quite often secondary conditions can develop because of the toll diabetes takes on the body. As mentioned in the list of symptoms, weight loss and urinary and skin infections can develop, as can conditions such as pancreatitis and cataracts. Circulatory problems and dehydration can result in reduced skin and coat quality, however, grooming can be beneficial for removing shed fur and stimulating blood flow around the body. Your dog may also take slightly longer to recover from minor injuries and illnesses and it is important you support his or her health the best you can with an appropriate diet alongside veterinary recommendations. Most vets tend to recommend a low fat, high fibre diet that will help slow down the release of glucose into the bloodstream. A quality source of protein is also recommended, as is the probably obvious caveat of not feeding your pet foods which include added sugars. These are sometimes referred to as “glucose”, “dextrose”, “various sugars” or “glycerol” on ingredients lists. Also, avoid “moist” or “meaty” chunk descriptions on dry pet foods as these often use sugars to acquire this texture. Maintaining a daily exercise routine for your dog that does not fluctuate too much will also help to keep blood glucose levels stable, as diet and insulin routines will be adapted to a certain output of energy in their day to day life. It is important to realise that all these changes to your dog’s health, the possible need for daily injections, thirst and oscillating blood sugar levels can make your dog feel more moody, anxious, aggressive or tired than normal. If this is the case try and keep their bed in a quiet area that they can escape to if they are not feeling well. If you have young children that might pester your dog then try to explain that he or she shouldn’t be disturbed when they take themselves off to bed. If you need to give your pet injections it is likely you may need to partially restrain them to keep them still or avoid them snapping at you. Try to make this a fuss-free time and reward them afterwards, not with food, but with lots of vocal praise, their favourite toy, a short walk or a scratch in order to begin associating injections with something pleasant. Many pet insurance companies will cover the cost of your pet developing diabetes if it is not already a pre-existing condition when the insurance is initially purchased. However, each policy is different and it is best to do your own research on this to see what the best cover option is for you and your pet. A healthy diet and regular exercise regime from a young age, as well as keeping your dog at an appropriate weight for its breed and size will go a long way in reducing the risk of diabetes development in your dog. If your dog begins to show any of the signs listed in this article then speak to a veterinarian right away. Catchpole, B., Ristic, J.M., Fleeman, L.M. and Davison, L.J., 2005. Canine diabetes mellitus: can old dogs teach us new tricks?. Diabetologia, 48(10), pp.1948-1956. Crane, S.W., 1991. Occurrence and management of obesity in companion animals. Journal of Small Animal Practice, 32(6), pp.275-282. Fall, T., Hamlin, H.H., Hedhammar, Å., Kämpe, O. and Egenvall, A., 2007. Diabetes mellitus in a population of 180,000 insured dogs: incidence, survival, and breed distribution. Journal of veterinary internal medicine, 21(6), pp.1209-1216. Fleeman, L.M. and Rand, J.S., 2001. Management of canine diabetes. Veterinary Clinics: Small Animal Practice, 31(5), pp.855-880. Kimmel, S.E., Michel, K.E., Hess, R.S. and Ward, C.R., 2000. Effects of insoluble and soluble dietary fiber on glycemic control in dogs with naturally occurring insulin-dependent diabetes mellitus. Journal of the American Veterinary Medical Association, 216(7), pp.1076-1081. Klinkenberg, H., Sallander, M.H. and Hedhammar, Å., 2006. Feeding, Exercise, and Weight Identified as Risk Factors in Canine Diabetes Mellitus1, 2. The Journal of nutrition, 136(7S), p.1985S. Peterson, M.E., 1995. Diagnosis and management of insulin resistance in dogs and cats with diabetes mellitus. Veterinary Clinics: Small Animal Practice, 25(3), pp.691-713. Rand, J.S., Fleeman, L.M., Farrow, H.A., Appleton, D.J. and Lederer, R., 2004. Canine and feline diabetes mellitus: nature or nurture?. The Journal of Nutrition, 134(8), pp.2072S-2080S.